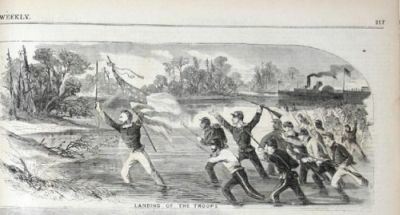 The Civil War battle at New Bern occurred on 14 Mar. 1862 between the Union forces of Maj. Gen. Ambrose E. Burnside and Confederate troops under Brig. Gen. Lawrence O. Branch. In February 1862 Burnside had swept across the northeastern sound region of the North Carolina coast with a powerful amphibious force of about 13,000 soldiers on transports, supported by army and navy gunboats, in a campaign that has become known as the "Burnside Expedition." On 12 March his fleet advanced up the Neuse River, carrying about 11,000 soldiers, with the intention of capturing New Bern, an important coastal trade center and the second largest town in North Carolina. On 13 March Burnside's troops landed on the riverbank at Slocum's Creek, near Havelock, and began their advance. At New Bern, General Branch had no more than 4,000 soldiers at his disposal to man a series of prepared defenses. The town's river defenses included lines of river obstructions and a chain of forts (Lane, Ellis, Allen, Thompson, and Dixie) on the west bank of the Neuse extending six miles below the town. Two lines of entrenchments protected the land approaches along the west bank: the Croatan Works and the Thompson Works. Branch concentrated his limited forces at the Thompson Works, the least exposed of the two. This strong entrenched line was anchored on the river bank by Fort Thompson (mounting 13 guns) and extended west one mile to the Atlantic & North Carolina Railroad. However, the Confederates were unable to fill a 150-yard gap in the line before the Union attack. Branch placed in the trenches between Fort Thompson and the railroad, from left to right, the 27th, 37th, 7th, and 35th North Carolina Regiments and a local militia battalion-all supported by two field batteries. The 26th North Carolina extended the line westward beyond the railroad, and the 33rd North Carolina was held in reserve. 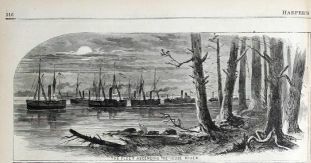 At about 7:30 a.m. on 14 March, Burnside's advancing Union forces, supported by gunboats on the river, moved in front of the Confederate lines to begin the battle. Burnside placed his First Brigade on the right between the river and the railroad, the Second Brigade west of the railroad, and the Third Brigade in reserve behind the two. The First and Second Brigades made little progress against the Confederate works, but part of the Second Brigade soon found the gap in the Confederate line and promptly broke through east of the railroad into the rear of the Confederate trenches, surprising the green battalion of North Carolina militia. The militia men broke in confusion, taking with them the next regiment, the 35th North Carolina. As Federals charged down behind the Confederate trenches, the next Confederate regiment, the 7th North Carolina, recoiled and counterattacked with a portion of the 37th North Carolina. This force drove out the Union troops and briefly reestablished the Confederate line. Meanwhile, Burnside's Third Brigade had formed for battle. Its attack broke through the same gap in the Confederate line just recently reestablished. The assault of these fresh troops overwhelmed the Confederates, who abandoned the works and retreated toward New Bern, evacuating the river forts as they went. Unaware of the retreat, the 26th and 33rd North Carolina were almost cut off. They only escaped by crossing the swamps to the west, leaving a portion of the 33rd North Carolina and its commander in Federal hands. New Bern was evacuated, and the pursuing Union forces took possession. Union losses were 90 killed, 380 wounded, and 1 missing, whereas the Confederates lost 64 killed, 101 wounded, and 413 captured or missing. Held by the Union for the remainder of the war, New Bern became the largest Federal stronghold in eastern North Carolina. Confederate forces made three unsuccessful attempts to retake the town. All images part of a spread in Harper's Weekly, 1862 titled: "The Burnside Expedition- The Storming of Fort Thompson at New Bern, North Carolina, March 14, 1862." Courtesy of Son of South, available from http://www.sonofthesouth.net/leefoundation/civil-war/1862/april/newbern-battle.htm (accessed May 16, 2012).